MARIKA JEWELLERY- an iconic brand. The aesthetics and skills involved in the making of objects have been influenced by visitors to Ireland through every period of her history, with the mid twentieth particularly fertile in the modern era. While little known, today, the Swedish silversmith Marika Murnaghan was one who played an important role in making modern design fun, fashionable and affordable in an Ireland emerging from the austerity of the 1950s. This was with her now iconic, modern Scandinavian style, primarily, silver jewellery. A newly confident Ireland responded with delight, and the Marika Brand was successfully established. The jewellery, affectionately recalled today, was marketed through its own dedicated boutiques. Having completed her training in design and silversmithing Marika Murnaghan, came to Ireland to marry in the mid 1960s. Shortly afterwards she began working in the Sheabac jewellery Workshop in south Dublin. The jewellery, however, only become popular when Murnaghan established her city centre workshop in the late 1960s. Thus the Marika Brand began in an Ireland ready for affordable modern design. Now too in comparison to what pertained previously women could now choose to buy their own jewellery, and did so in their droves. This receptiveness to new ideas was influenced by a number of factors, one being the increased access to international fashion and music via the print media and that of television, in particular the British channels. 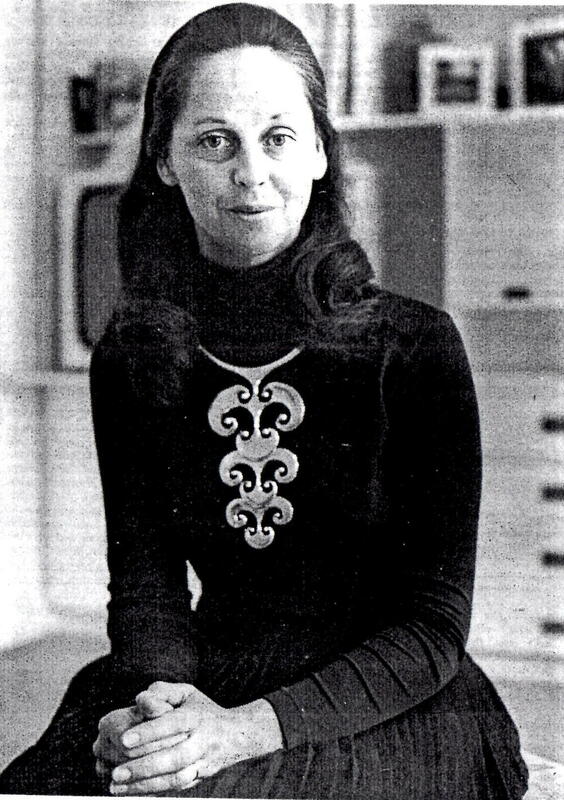 Another was the modern Scandinavian influence brought by visiting European designers to the jewellery and silverware made in The Kilkenny Design Workshops ( 1965-1988) The Marika Jewellery Brand had, however, a far greater share of themarket. Marika Jewellery was a fine example of modern Craft Design. The collections were designed to appeal to a fashion conscious clientele, and comprised ranges of simple fresh modern abstract shapes, often set with gemstones-Figures 2,3. Murnaghan appreciated Irish culture, too, and referenced it both in her collections and unique pieces. An example from the collections is her interpretation of a Penannular brooch, as illustrated- Figure 5. This minimal design was in sharp contrast to the often insensitive reproductions , generally available, of artefacts such as the Tara Brooch, that catered for the long established market for Celtic jewellery. In time to cope with demand, a Marika manufacturing facility was established- fondly remembered by ex employees, who numbered forty towards the end of its time. The print media and television, were employed with in depth interviews and exhibition reviews. This was a unique approach to marketing for an Irish jewellery brand. Additionally Murnaghan completed an extensive portfolio of silver ware, and unique pieces. An example for jewellery is the elegant neckpiece she is shown with in Figure 1- a modern interpretation of Celtic imagery- clearly designed to draw attention to the wearer. Murnaghan undertook many important commissions. An example, in 1983, was her platinum comb which was the first piece of platinum hallmarked in Ireland-see Figure 5. Fig. 5 Unique platinum comb. We are fortunate to have a selection of Murnaghan’swork on permanent display in the National Museum of Ireland, where her contribution to design in Ireland may be appreciated. With her passing a unique modern Brand for Jewellery that shone for twenty years in Ireland, faded to memory. The story of the Marika jewellery Brand is very inspiring, particularily the ambition tobring modern affordablejewellery to what became a very receptive market. The timing was perfect – at the cusp of change. Marika Jewellery and silverware: National Museum of Ireland-Decorative Arts and History.- Out of Storage. Marika Murnaghan archive-National Museum of Ireland – relates to the purchase of examples of Marika work and contains press cuttings. Figure 1, Murnaghanwearing unique silver pendant. Archive – National Museum of IrelandThe Irish WomanSeptember 1978. Courtesy the Irish Country Women’s Association. Figure 2, Marika Jewellery . Archive; National Museum of Ireland. Evening Herald 1970. Images CourtesyIndependent Newspapers. Figure 3, Selection, Marika Rings – Archive; National Museum of Ireland – Evening Herald 1970 Courtesy ; Independent Newspapers. Figure 4, Marika Retail outlet. Archive; National Museum of IrelandEvening Herald1970. Courtesy Independent Newspapers. Figure 5, Decorative Hair comb, platinum. L16.5cm 1983. The Company of Goldsmiths of Dublin – Exhibition 1637-1987. Courtesy; The Company of Goldsmiths.